Understanding biological and emotion reactions to stress, as well as learning ways better adapt to stress will help a person better prepare themselves mentally for a disaster scenario. So many get caught up in compiling survival tangibles we forget about the most important asset – our mental preparedness. Mental preparedness implies possessing the right frame of mind to handle stress before, during and after a disaster. This aspect of preparedness is directly connected to spiritual preparedness. Spiritual preparedness strengthens based on the established core belief system that guides and serves you throughout your walk of life. Once your spirit is prepared, you will become more mentally prepared for dealing with a disaster situation. Mental preparedness sounds great, you may say, but stress has a physical toll on the body, how can we prepare for that? Understanding chemical and biological reactions to stress will shed some light on how stress affects us all. Biologically speaking, stress or anxiety (especially after an unexpected event) leads to a short-term imbalance of neurotransmitters such as serotonin and norepinephrine. This leads to physical and emotional reactions to stress. For tips on how to curb these natural reactions and reduce stress, click here. One principle you must keep in mind when dealing with emergencies is that change is inevitable. Change is the one true constant in this universe, yet it is something we tend to stress about and avoid all together. Many do not handle stress well because they are unprepared to deal with what has been thrown at them. They are resistant to change. This rigidity will only hinder them from finding solutions. Disasters bring change and a lot of it. An aspect of mental preparedness, therefore, is learning to be more fluid and respectful of change in your day-to-day life. This ease in movement and acceptance of change will help you adapt more quickly to all situations. The more flexible you learn to be, the more adaptable you will be in an emergency. We have all heard that practice makes perfect. One way to be mentally prepared for situations of extreme stress, therefore, is to practice rehearsal drills. Consistent practice will turn your life-saving plans into muscle memory. This rehearse-to-be-ready concept is how many emergency personnel and even athletes train to condition their mind and body. This could make all the difference when stress is sending your neurotransmitters out of whack. Even implementing stress relief techniques when responding to daily stress helps. The daily “minor disasters” give valuable insight into your mental and physical reaction to stressors, allowing you to know how you best perform under pressure. Start learning about disasters, how people are affected by them and the dangers they may encounter. Research first-hand accounts of survivor stories and recent disasters to learn what the victims came up against and how they survived. Invest in some survivor literature such as: Patriots by James Wesley Rawles, One Second After by William R. Forstchen, Lights Out by David Crawford, the Left Behind series by William Tim LaHaye and Jerry B. Jenkins. Watch some survival/apocalyptic movies such as, The Day After Tomorrow, The Road, Jericho, Survivors, The Book of Eli, or Outbreak. Discuss disaster scenarios and plans with other like-minded individuals. This is a great way for you to be aware of your community, your plans, and your current state of being. To be even more thorough, find out what disaster plans your community has in place so that you can plan more accordingly. 1. 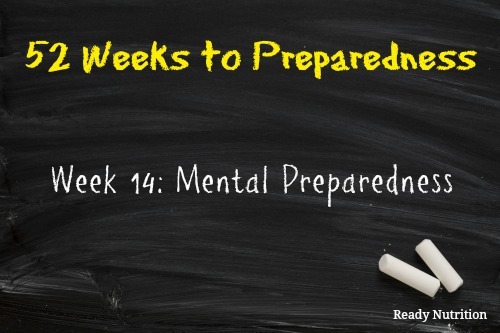 Decide which emergencies and disasters you need to be mentally prepared for. 2. Take some time and brainstorm potential disaster scenarios from this list. What stands in your way of preparedness? Think about how your family could be affected, what types of dangers you may face as a result of being in these disasters, etc., and find ways to be prepared respecting your mental reaction to stressors. A Distant Eden by Lloyd Tackitt is super informative.